Jesus asked [his disciples], "Do you finally believe? But the time is coming — indeed it's here now — when you will be scattered, each one going his own way, leaving me alone. Yet I am not alone because the Father is with me." The disciples think they believe. They think they are courageous and loyal. 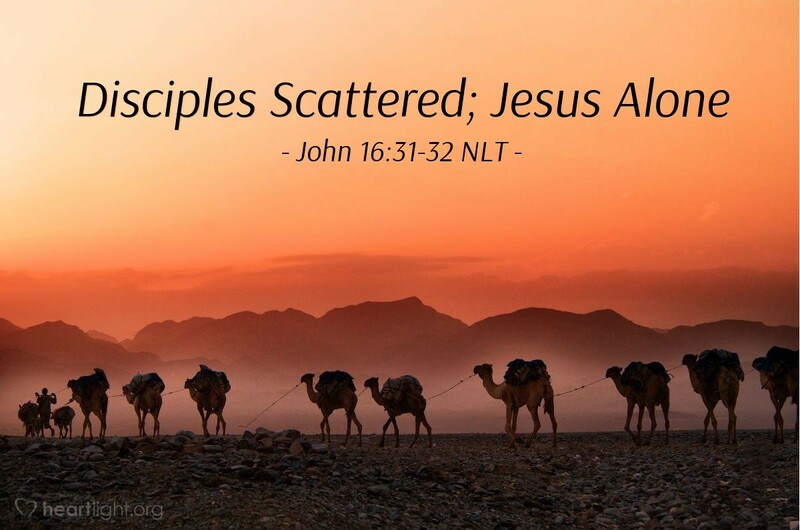 Yet they will all scatter and leave Jesus alone. He will face the horrors of the cross by himself. Yes, the Father will go with him. But on the cross, Jesus will even feel abandoned by the Father as he bears the weight of the world's sin alone, forsaken, mocked, ridiculed and tortured. And why did he do it? He did it to save you. He did it to save me. He did it to save the lost world. So how can we keep from sharing such costly grace with those who do not know it? Give us, your people, your church, the courage to proclaim your grace in ways that clearly communicate it. The unspeakable horrors of Jesus' betrayal night and crucifixion day humble us, dear Father, that you and he would love us so. Lead us to redemptively love others who do not know this grace as their own. In Jesus' name, I pray. Amen.